Auto Finesse Iron Out (IO500) Iron Remover is a reactive iron contamination disolver. Auto Finesse Iron Out will react and dissolve contamination from all exterior surfaces, paintwork, wheels, glass and even trim, with its pH neutral formula. Simply spray, allow to react and then rinse off. Auto Finesse Iron Out also does a great job on breaking down and removing baked on break dust which makes it a very effective deep cleaner for your wheels. 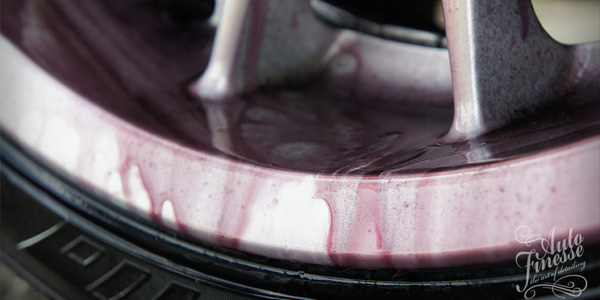 Auto Finesse Iron Out is designed for use on paintwork to remove iron contamination. Prior to the claying stage, using Iron Out can dramatically reduce the time of the claying process. When Iron Out is used prior to claying it also helps reduce the risk of marring as it removes the harshest and most abrasive contaminants without agitation, with its main active ingredient braking them down prior to this stage. We offer a number of shipping methods for Auto Finesse Iron Out Iron Remover 500ml based on your location and the weight of the ordered items. We always aim to offer you delivery of your products by the cheapest method for the total weight of your order. Detailed Clean India are more than happy to ship internationally the Auto Finesse Iron Out Iron Remover 500ml, for an accurate quote add the item to your basket and then view the shopping cart where you can get an accurate shipping price based on the weight of the order. Auto Finesse Iron Out Iron Remover 500ml has an average 5 out of 5 based on 2 ratings ( 2 user reviews). The reviews submitted below are genuine customer reviews and are their real opinions. For that reason we believe they are useful and trustworthy to you, a potential new purchaser of the Auto Finesse Iron Out Iron Remover 500ml. Overall Auto Finesse Iron Out Iron Remover 500ml has an average 5 out of 5 based on 2 reviews. The quality of product is amazing. its very effective chemical for wheel rims cleaner. Auto Finesse Iron Out – I liked it the way it worked!